Lynne McNeil looks back at the proud legacy of social care in the Church of Scotland which can be traced back to 1869. VICTORIAN Scotland was a place where the gap between rich and poor was sharply in focus. Death and disease were rife and many lived on the margins of existence. Social care as we know it today did not exist, although churches were known for their support and work with the poor, but this was very much on an ad hoc basis. But one of the Church of Scotland’s great visionaries of the age, the Rev Professor Archibald Charteris (later Very Rev), saw the potential for a church wide initiative that could provide care and support for the most vulnerable people in society – but also be lexible to the changing needs of the age. As the first Convener of the Committee on Christian Life and Work within the Church, he was one of the people who helped sow the seeds of ‘care in Christ’s name’ that launched formally in 1869. 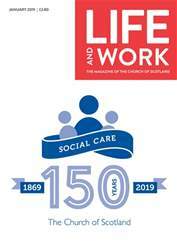 IN THIS ISSUE CELEBRATING 150 YEARS OF SOCIAL CARE - A look back at the proud history of social care in the Church of Scotland. REMEMBERING THE IOLAIRE - How the Isle of Lewis will mark the sinking of the Iolaire, 100 years on. LEST WE FORGET - A gallery of images from across Scotland as churches marked the centenary of the end of World War One BURNS DAY - The Very Rev Dr John Chalmers looks at the Bard’s relationship with the Church. - The Very Rev Dr Finlay Macdonald offers prayers based on Burns’ poems.